Leeds Rhinos captain Kallum Watkins in action against Warrington Wolves last week. I WANT to thank all the fans who made the journey over to Warrington last week. The support we had was brilliant. I knew we’d take plenty of numbers and that’s something we are really proud of as a club. 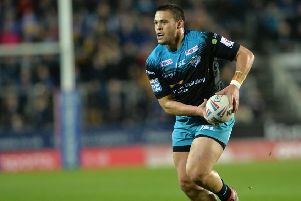 Former Rhino Jimmy Keinhorst in action for Hull KR against Hull FC last week. Obviously the result didn’t go our way, we didn’t play well enough, but we are thankful for the fans’ backing and we want to repay them a little bit better tonight. We need to play a lot better at Wigan than we did last weekend. It is always tough playing anyone in Super League and we have got four away games to start with and a short turnaround this week, but it is what it is and what an opportunity for us to put things right from the opening game. We were all disappointed, it was a tough loss, but it’s the start of the season and we need to learn from that and move on and focus on Wigan this week. We want our sport to be huge and it is, but we want it to be bigger and more recognised. The first week was really good in terms of that. It is down to us what we do. We have got to focus on getting some areas right and make sure we implement certain things into games. We probably couldn’t do what we wanted to in attack because of what we were doing in D.
Our D wasn’t good enough, we allowed them too many off-loads and didn’t respond well enough to it. Learning from that is the main thing now. Former Rhino Mitch Garbutt scores Hull KR's second try against Hull FC. I watched the games on TV last week and I think it was a really good start for the competition. People have to get used to certain new rules, but the opening weekend was promoted well and the two derby games were good spectacles. There was a good turn-out at those and the atmosphere at Warrington was really good as well, as expected. That’s positive signs for Super League and long may that continue. London Broncos coach Danny Ward. I was pleased for Jimmy Keinhorst and Mitch Garbutt after their impressive debuts for Hull KR, especially with it being a Hull derby. Magsy was good as well in terms of getting them back into the game and setting up the winning try for Jimmy in the last seconds. I was chuffed for them and they will take great confidence from winning the game the way they did. Hull KR will be looking to improve this year and, with the signings they’ve made, they will be difficult to beat. It’s the same for London. I know a lot of people were saying they might not win a game this year, but they got off to a flier by defeating Wakefield. It was a fantastic result for them. I think the emotion and the pride they’ve got out of getting back into Super League, which is huge for their club, really showed. It is important to start off on a good foot and they did that against a good team. Wakefield have got some really good players and they will be a tough team to beat throughout the season so it was an incredible result for London and they’ll take great confidence from it. Danny Ward does a great job for them in terms of coaching and he’s a good fella as well. He’s a great character and he gets the best out of his players. That’s all you need, if they go out and do their job the results will come and obviously they did last Sunday. It’s good for Super League as well. We all want a competitive league and for everybody to be able to beat everybody. London winning proved you can’t take your foot off the gas. London can be a dangerous team, they score plenty of points and they are pretty handy with the ball. It shows it is going to be a tough league and even more competitive than it has been the last couple of years. It is going to be interesting to see how everything pans out.